Thailand provides each visitor with a remarkable blend of old age culture, history and natural beauty whilst providing all the amenities and advatages of the modern world. For avid shoppers, Thailand is a paradise. Traditional products such as silk, cotton, ceramics, teakwood carvings and furniture remain excellent buys. Additionally, clothes (ready made and custom tailored), leather goods, gems and jewellery are also popular buys. Festivals are also an essential part of Thai life. 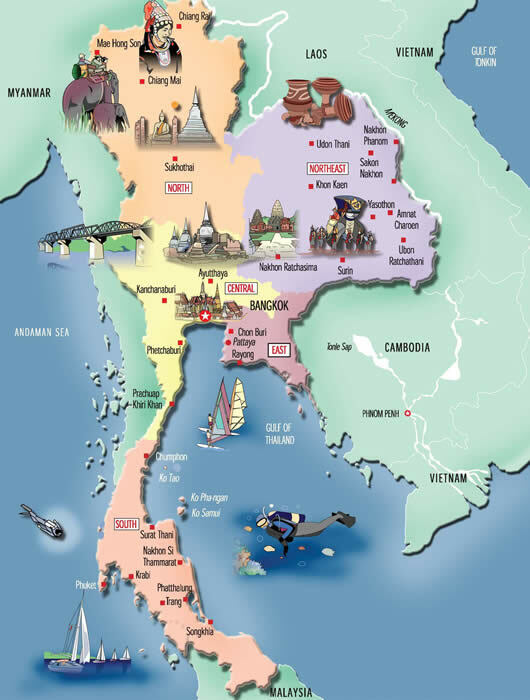 It is the Thai people however, who really make Thailand such a special destination. They retain a vibrancy and love for life that shines with a warm welcome. When considering resort areas Thailand has something for everyone. The resort areas boast warm clear water and palm fringed white sandy beaches. Phuket and Koh Samui are two of the better known resorts, however, the nearby Phi Phi Island and krabi are also options that must be considered for those really wanting to get away from it all. So, whether you want a holiday with plenty of nightlife and shopping, a quieter family holiday or a beach resort, Thailand is ideal to suit your individual requirements.